Looking to continue your non-profit education? We've got you covered. In April, you can choose from among 22 free webinars that offer up a host of insights, ideas and practical tips on topics like: Social Media Strategy, Google Analytics, Volunteer Retention Strategies, Fundraising, and much more. In our upcoming Wild Apricot Expert Webinar, Tobi Johnson will help you understand what drives volunteer satisfaction, particularly that of highly skilled volunteers. The session will explore how volunteer motivation and needs change as they progress through levels of engagement. In addition, we’ll share a list of volunteer orientation “must haves” and how to design an onboarding process that speeds up engagement and promotes a strong sense of leadership in your team. This webinar is led by Tobi Johnson - volunteer training expert and founder of Tobi Johnson & Associates. Explore the world of corporate support and tools and resources on corporate giving. Seeking to target companies that might fund your organization? Finding it hard to get information? Need to get beyond the Yellow Pages? Join GrantSpace for an introduction to the world of corporate support for nonprofits and funding research tools to help you identify corporate prospects. Get tips and strategies on how your organization can leverage giving days, like upcoming Give Local America on May 5, to increase online fundraising support. Presenters will share the secrets to successful campaigns and how giving days can help broaden your base and grow your donor lists. This Techsoup event is best suited for U.S.-based nonprofit organizations, libraries, and churches looking to further their online fundraising goals. More than a decade into the Social Web, mathematicians and social scientists have had ample time to study how, when, and why online individuals engage with NGOs on social networks such as Facebook, Twitter, and Instagram. Most NGOs are not yet aware of the scientific data about online social behavior, but once learned NGOs can significantly improve their use of social networks to communicate their mission and programs and fundraise online. Based on the math and science of social media, this OnGood webinar will feature 20 tips and tricks to maximize engagement on social networks. When your organization welcomes new volunteers, how do you screen them? It seems every nonprofit has a different process and set of standards, and we think it's time to make the whole experience easier and better. Late last year, we partnered with a national identity service provider and conducted a survey to gather information about how nonprofits screen and authenticate volunteers. Thousands of responses later, we’re ready and itching to share some truly valuable insights about risk management and volunteer engagement with you – and to hear some more good ideas in return. Join VolunteerMatch for a special, free webinar on the best strategies for screening new volunteers and identifying potential risks to your organization. No matter what your current risk management practices, you’ll gain some great insight into how other nonprofits approach this issue, and how you can determine the best policy for your organization. This OnGood webinar begins with a general introduction to LinkedIn, a social network with more than 300 million professionals worldwide, and then moves on to feature 15 best practices for participating in the LinkedIn community through LinkedIn Groups and LinkedIn Company Pages. Attendees will learn how to successfully create, manage, and promote a LinkedIn Group for your NGO and will demonstrate click-by-click how to manage discussions, templates, and announcements. Also featured is how to tap into the power of LinkedIn Company Pages. The webinar will demonstrate how to claim and set-up your NGO’s Company Page, give a tour of the Admin Panel, and then discuss how and when to share content with your followers. Join Idealware for a free webinar as we look at the six reasons why people love infographics—and why you might consider adding them to your communications mix. Over the course of the hour we’ll review a wide range of successful infographics and talk about what makes each of them great. Obtaining grant funding from foundations, corporations, and public agencies is a competitive process. Before beginning a lengthy proposal, applicants must carefully assess their alignment with grantor guidelines, interests, and funding priorities. Otherwise, the endeavor will force an organization to contort itself to meet grant requirements, squandering time and resources while distracting from its true mission. This 4Good webinar, led by a grant proposal writer who has successfully obtained millions for nonprofits based on careful evaluation of grantors, will share tips about best practices for reviewing grant guidelines, eligibility requirements, and funding priorities. Tools for assessing and evaluating whether to pursue a grant opportunity. Techniques for eliminating requests that are unlikely to succeed. How to encourage better-conceived grant ideas from staff and board members. This Nonprofit Hub webinar will walk participants through, step-by-step, the process of crisis preparedness. How do you know you’re in a crisis? What are the strategies to find your way out of a crisis? How do we structure the response? And most valuable to nonprofits: How do I protect my organization’s reputation while still promoting our cause? Through the lessons of real-life examples and tailored scenarios organizations are most vulnerable to, participants will leave this webinar with a better understanding of how to handle a crisis, what it takes to effectively prepare for one, and the precise elements that should go into any PR crisis plan. Deepen understanding of the communications elements and approaches that should be considered when constructing a crisis communications plan. Learn effective and creative strategies for selling the idea of crisis planning to executive leaders, including planning that requires the commitment of resources. Understand variables that transform a manageable circumstance into a full-blown crisis – known as crisis catalysts – how to identify those catalysts, and how to mitigate them. Explore strategies designed to neutralize these crisis catalysts, manage internal players critical to the response, and prepare executive spokespeople for public communications. Are you new to the field of grantseeking? Discover what funders are looking for in nonprofits seeking grants and how to find potential funders in this newly revised GrantSpace webinar. You want to share the impact volunteers have in your organization and in the community, but often the information you track doesn’t help you tell that story. This webinar will help you move past number of volunteers and number of hours and start telling the real story. In this VolunteerMatch webinar, you'll learn about information gathering and the key components to good storytelling, how to evaluate your current measurements and how to build support for a more thorough measurement and evaluation program, and how to engage other staff – paid and volunteer – in this work. You'll also receive a worksheet to help you begin to tell the story of volunteer impact in your organization. Ensuring resources - human and financial - are an essential board responsibility, but many of us cringe at the mention of fundraising. Join this 4Good webinar to learn more about what fundraising really means for board members and the specific, fun ways to get involved in ensuring financial sustainability for your organization. This is a great opportunity for board, staff, and volunteers to learn about the essentials of fundraising and different ways to fundraise for your organization. Say goodbye to being overwhelmed by the information in Google Analytics! In this TechSoup webinar, you will learn about the data metrics that are most applicable to your nonprofit’s website, what each data point is actually telling you about the areas of your website that need improving and practical ideas that you can start using to improve your site. This OnGood webinar begins with a demonstration of how NGOs can successfully design and launch a YouTube Channel even if the NGO isn’t currently producing videos. The webinar then discusses the basic hardware and software needed to create videos in-house on a limited budget. The webinar also demonstrates click-by-click the features of YouTube’s Nonprofit Program, explores the extensive YouTube tool set, and showcases NGOs that are excelling in their use of video. If your organization is like many, you sometimes find it difficult to capture high-quality images for use on your website, in presentations, and in your collateral materials. Perhaps you have video clips and also struggle to source background music that doesn't get removed by YouTube for copyright infringement. We're here to help! In this free, hour-long webinar join TechSoup's Jim Lynch and Creative Commons' project manager Jane Park to learn the where to source free images and music for your nonprofit or public library. We'll also help you better understand the different ways to license your own creative media. Learn to prepare and present a budget in a grant proposal in this GrantSpace webinar. This OnGood webinar demonstrates how NGOs can implement a successful social media strategy. Topics include understanding how much time and financial resources social media requires, how to track success, and how to craft a social media policy for your NGO. Attendees will also learn the importance of integrating their online communications and fundraising channels in order to maximize awareness of their cause and increase online donations. The webinar will also discuss which social networks an NGO should utilize and why and touch upon the importance of embracing real-time communications and cause awareness days. 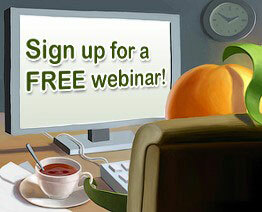 If your organization offers a free webinar that would be of interest to non-profit, membership or volunteer-based organizations and you want to include it in next month's post, please email a brief overview (like those above) to farhad@wildapricot.com no later than April 18.